Found one file extension association related to Adobe Collage for Android and 1 file format developed specifically for use with Adobe Collage for Android. 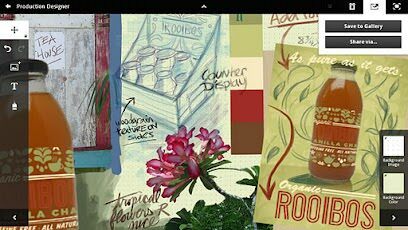 Adobe Collage lets you capture and refine concepts by combining inspirational images, drawings, text, and files from select Adobe Creative Suite components into modern, conceptual moodboards. Upload your files to Adobe Creative Cloud to refine later or share with others. Create modern moodboards with mixed media. Import PDF, PSD, and AI files. Search and import content from Google and Flickr. Use the growable canvas to add assets as needed. Draw with multiple pen types. Add text with a variety of fonts. Leverage existing content library in Adobe Creative Cloud* to refine further in Photoshop. The Adobe Collage for Android software seems to be old or discontinued. If you need more information please contact the developers of Adobe Collage for Android (Adobe Systems Incorporated), or check out their product website.